Product #22097 | SKU PROSET-3 | 0.0 (no ratings yet) Thanks for your rating! 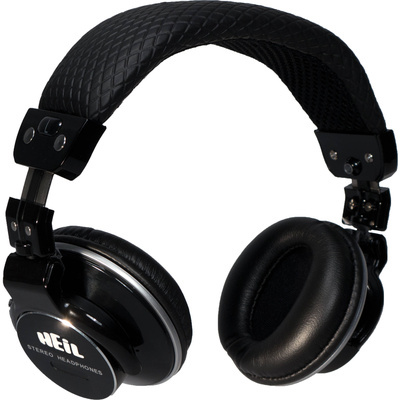 The Heil Pro Set 3 Stereo Headphones were designed by Bob Heil for a wide variety of applications such as studio recording, casual listening, amateur radio, Internet and commercial broadcasting. The over-ear headphones weigh only 7 oz and feature padded ear cups so that they will be comfortable and non-fatiguing over long periods of time. They provide a wide frequency response of 10 to 22,000 Hz. To accommodate different listening situations, the headphones come included with three detachable cables: a 5.9' flexible straight cable with an 1/8" headphone plug, a 5.9' straight cable with an iPhone and iPod compatible 1/8" plug, and a 9.8' coiled cable with an 1/8" headphone plug. The cables have twist lock terminating 1/8" gold-plated connectors. A 1/4" gold plated screw-on adapter comes included with the headphones.